The Samsung SL-M3870FW is a high-speed printer and image processor that offers wireless support and robust paper handling features. It is the best choice for workgroups and home users, offering fast print rates and superb efficiency, thanks to its high input capacity, which is expandable to as many as 820 sheets, with the optional cassette. 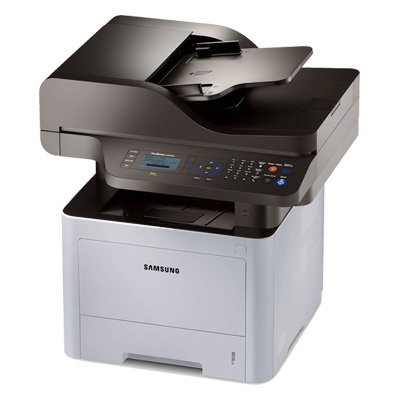 The Samsung SLM3870FW offers multifunction features, including high resolution copying, scanning, and high-speed faxing. It is a good choice for businesses, offices, and homes with high print demands, but it only supports black and white printing. The Samsung SL-M3870FW printer measures only about 18.5x17.5x19 inches, making it the perfect desktop companion. It has a sleek black and white design, making it a stylish addition to any office. It features its own ADF unit and a comprehensive control panel for easy menu navigation. The Samsung SLM3870FW printer also has a built-in duplex unit for convenient double-sided printing. It has a standard 250-sheet input tray, which is expandable with an optional cassette. Ideal for workgroup use, the SL-M3870FW printer offers network capabilities. It also offers wireless functions and it offers superb print and copy rates of up to 40 pages per minute. It has a 33.6 kbps print modem and it has fax to PC and email, along with speed dial and delayed fax functions. It produces high resolution prints up to 1200x1200 dpi, and it can handle a wide variety of media types, including labels, cardstock, transparencies, and recycled paper. The SLM3870FW printer offers excellent multifunction features, but it does not support colour production.